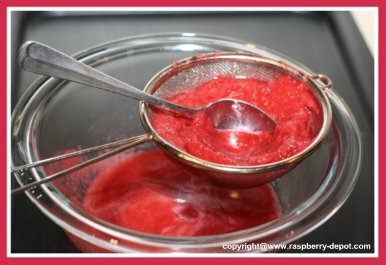 This Homemade Raspberry Sauce Recipe is a basic, easy to make sauce or syrup made with raspberries without flour or cornstarch. If you like raspberry sauce WITHOUT the seeds, this is a good recipe for you. Pulse the raspberries in a food processor or blender until just broken up. Sift the confectioners (icing), sugar over the berries and add the water and the salt. Pulse once or twice more. Pour the above mixture through a coarse strainer and set over a bowl. Press hard on the solid to extract as much juice as possible. Shake well before serving chilled. Yield: about 2 cups of sauce/syrup. *Note - the Raspberry Sauce may thicken a bit from standing. If this occurs, add water as needed to thin to the desired consistency before serving. 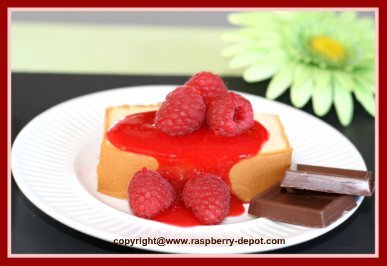 Delectable raspberry sauce is so versatile ... use it to top pound cake, cheesecake, ice cream, pudding, waffles, pancakes, brownies, add it to beverages, and much more!